It's one of those day that you are too excited about visiting a new restaurant and forget the restaurant's operation hours and after driving miles to get there only to find it closed (Ad Hoc restaurant, Yountville, on Tuesdays and Wednesdays ). It was close to 6 pm, and I was very hungry. Luckily the neighbor restaurant Pacific Blues Cafe was open. The restaurant's kitchen area is viewable from the seating area. A couple of customers were dining at the time. Two chefs are busy waiting for the new orders. The servers are friendly and it's a cozy place inside. Within an hour, the inside seatings are filled with customers. Looking at their attire and greetings of each customers to each other, they are returning local residents and know each other. I ordered one of the specials of the evening - Sauted Halibut with dilled caper cream sauce, garlic mashed potatoes, and buttered vegetables. I also requested my Halibut to be cooked well as I like mine with crispy crust. When my order arrived, I was very pleased with its presentation and nice aroma. I am glad to see my halibut with crispy crust. The halibut is still moist and I love that dilled caper cream sauce on Halibut. It is a great combination. It brought out the halibut flavor. The tangy sour flavor of caper burst in the mouth as you bite into the halibut and creamy sauce mellows it out. Buttered broccoli is well prepared. Cut in uniform size. Fresh taste. Garlic mashed potatoes gave another dimension of soft and creaminess to the dish. It really made my trip well worth the while. Truthfully, when I returned to the Yountville two days later and found out that Ad Hoc was engaged in private party, I wanted to go to Pacific Blues Cafe, again. That is a good sign of a good restaurant, I thought. I am pleased with the last dining experience and I remembered the wonderful taste of the sauted halibut. I think this has been quite a month for the food adventure for my study. It's time to enact it in my kitchen. I am hoping to incorporate some of this food adventure experiences and turn out variety of tasty dishes. 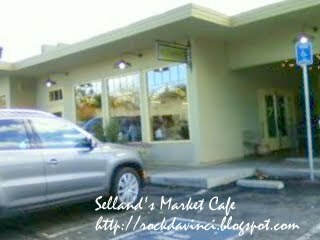 I made a special trip to the Selland's Market Cafe in mid-town Sacramento. It has been opened for about 10 years is what I heard. I did not know that. As our instructor encouraged us, "Go out and eat and find out" as part of the "Becoming a Chef" learning experience. So, I have been, and it was a good trip. It is a busy cafe at noon. The interior is cozy with some tables for two's and four's and large long family style bench table. There are some outside seating as well. Just like a market, you order the food you see in the display cases - a-la-cart. 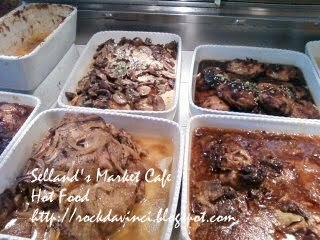 You can see all the hot food, cold salad/pasta, desserts in the display cases. You can order hot and cold sandwiches, pizza, too. Servers are friendly and will bring food that you ordered to your table. Customers seem to be enjoying the atmosphere and not minding sharing the large dining table when the cafe got full. 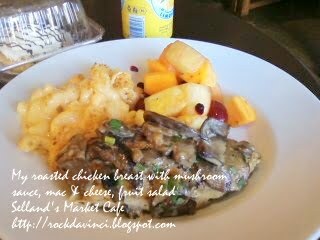 I ordered Chicken Breast roasted with mushrooms, sherry and cream; mac-cheese; fruit salad, and banana cream tart. While I was enjoying my lunch, the order line wrapped around me. It kind of reminded me of the eating experience at a popular mom and pop street vendor where the line starts to form around you, and they are practically standing right over you as you eat. But, that's when I heard not one, but several customers asking their accompanying 'friend' how to order the food. That means they are first-timer like me. That's a good sign. Previous visitors returning with new customers. I really liked the roasted chicken breast. I usually like the 'dry' chicken meat, but this was very good. It is tasty all the way and the mushroom cream sauce did not overwhelm the chicken, but together they were like a team in the mouth to make my lunch all so much better. Mac-cheese tasted creamy and satisfying. I like the combination of in-season fruits - persimmons and pomegranate and apples, etc. in the fruits salad. Banana cream tart - I don't know why I ordered it. The banana tart is not in my favorite pie list. May be that's the reason why. I wanted to see if it would change my mind. 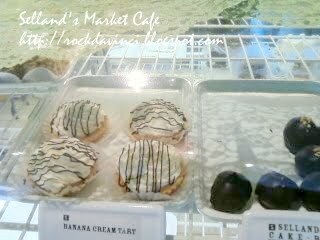 There were so many other pastries to choose from, but I ordered the banana cream tart. I didn't think the pastry cream complemented the banana. I ate the whole thing though. Something was missing ... I wanted to say, "I am eating a tart with Banana covered with cream." But I did not connect to it. But it is okay. The main course was great. I ventured one more time to the local restaurant to find out what makes their dish attractive. What keeps the guests satisfied and come back. It was a rainy Sunday. Wet and cold. It's a perfect day for hot soup. Once I stepped into the restaurant, I forgot about the weather. The place is cozy, warm color coordinated, rustic and romantic at the same time. There were several large parties, including babies and kids. While I was deciding on what to order, squash soups for the party across from my table have arrived. I heard immediate reaction of "wooo!" 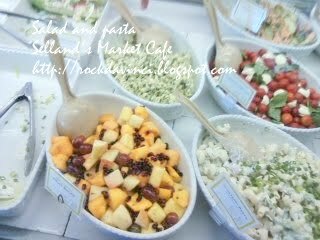 then, when their salad arrived, some of the comments are: "This salad is so good. So fresh. This place is so good. I love the taste." I was going to order the squash soup, too, but when I found out that the fresh market fish - Mahi Mahi is served with grilled squash, I decided on grilled prawns salad. It was a good choice. I had mimosa, limosa, salad: grilled prawns butter lettuce, pt. reyes blue cheese, candied walnuts, apples slices, maple vinaigrette. Market Fresh Fish - MahiMahi with Pineapple salsa and roasted squash. Devil’s Food Cake - three layers with rich ganache made from Valrhona chocolate and garnished with sour cherries and whipped cream. There was just enough vinaigrette and expounded on the blue cheese. Apple slices was a good choice to cut that bit of bitterness in the blue cheese and butter lettuce tasted so fresh. Grilled prawns could use a bit more salt and some kind of spice, but the they were grilled perfectly. MahiMahi dish was very colorful and delicious to look at. Placing on top of banana leaf added the tropical flavor. Glad to have that grilled lemon. Its juice gave the MahiMahi the boosts. I felt that MahiMahi is bit bland also. But since my palate has been in this food adventure, it could be that it has gotten a bit tired. The pineapple salsa saved the MahiMahi and I would have enjoyed it if there were just a tablespoon more to finish the fish. As for the grilled squash, I thought it was a bit too chunky for the beautiful Mahi presentation placed on top of beautiful green banana leaf and grilled lemon halves. Some of them were too chunky and there was not much taste toward the center - bland. But nevertheless fresh and beautiful. I think people love to support local produces and organic products. They also know who is cooking with fresh ingredients and others from out-of-can. It was a good lunch experience. I visited Black Bear Diner off Highway 80 the other evening. I ordered Black Bear Dinner Combos - BBQ Pork Ribs and seasoned sliced Tri-Tip Steak. I chose soup of the day - Chicken Noodle soup. Overall experience - disappointed. I sat at the counter facing the kitchen. Services - the waitresses were very attentive. Food - I think the cook could have paid more attention in the details and made it better. When I am spending money to eat out, I expect the food to be "yummy" or "I want to come back." I don't think I am impressed with the BBQ Pork Ribs and sliced Tri-Tip Steak I had. The chicken noodle soup looked like what I used to fix quickly at the office in the microwave after I dump the chicken noodle soup out of a packet into a cup filled with hot boiling water. 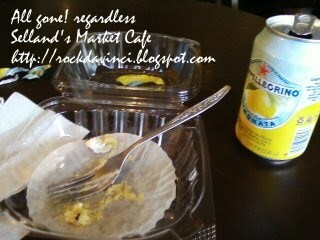 I thought it was supposed to be served with a Corn Bread Muffin, but I got a cracker. The baked potato tasted dry or it's been sitting in the oven for a long periods of time because I can taste the somewhat 'burnt' taste of the skin in the potato. And the potato looks hollow the way it is served. The BBQ pork ribs came right off the bones and that's a good sign, but I can't quite say, "Yum". Did they remove the 'silver' in the back of the pork ribs? The vegetables seem like out of the freezer and just sauted? or is it fresh vegetables sliced by untrained hands. I like to eat sauted onions, but they are mostly outer layer of the onions and they were tough. Too bad. There must not have been many customers who ordered the Tri-Tips because they tasted dry like it's been sitting there for a long time. Didn't have the 'heat through' or 'cooked fresh' just for your order feeling. So, in this food adventure, I was bit let down by this brand new restaurant in our area. Too bad for those cute cuddly bear decorations. So, I was wondering, if you are given all the same food ingredients, would you have prepared them any differently or most of all presented them differently on the plate. Would the vegetables looked more appetizing than the others if they have been cut or sliced differently? It's a challenge to keep the food taste fresh and cooked per order 'like' when it may be prepared ahead of time. Since it's my goal to try as many master chef's formula and practice on techniques, I chose to make Croissants from "Baking with Julia" cookbook. I prepared the dough around 2 pm, and I just now finished baking them - 10:30 pm. What interested me in her book's Croissant recipe is the dough process and 'forming' or the 'shaping' technique. Once the dough is portioned, the triangular shaped dough is pulled and stretched twice its original size. Then, right before it is rolled into horn shape, a scrap piece of dough shaped into football is placed in the center to help give the baked croissant the plump "belly" look. While the instruction is very detailed, I missed the "moisten the hands with moist towel" part and pull and stretched the triangle shaped dough. Although I had 24 chances to do it correctly, I did not find out until I was done. However, while I was viewing the illustration images, I was wondering the whole time while I was doing mine why or how the chef managed to stretch it so nicely and smoothly without causing the tear. I also didn't roll the scrap dough into football shape, but I just cut them into equal amount of croissant triangles ready for rolling; then, used it as is. Luckily the croissant turned out wonderfully. Today, my kitchen temp is around 67'F. Rainy day. Once the dough was ready for the butter block, I divided the dough into halves. This will allow me to roll the dough within the available work surface' area. The first group of croissants are baked at 350'F. The base of the triangle is 4-inch wide. Yielded 14 croissants. They have beautiful crust. It is crispy with distinct layers. The croissants are light. Butter did not leak out much at all. The second group of croissants are filled with chopped cranberries and raisins. The base of the triangle is sliced at 6-inch. Yield: 10. They were baked at 375'F. They turned out beautifully as well. I had a bit of doubt with my dough at the beginning. The recipe called for 1 Cup of Milk for 3-1/2 C of flour. My dough really felt dry in my mixer. I added approximately 1/2 C more liquid - just water. But the dough really felt tough. I decided to knead the dough regardless and also included pound or slam or slap method for 10 - 15 min. All that time, I was thinking, may be I should have added the salt after allowing the flour to absorb the liquid first, then, added it. But, that's not what the instruction says, so I just followed the instruction. Mixed all ingredients together in the mixer. But with everything, I need to know how to of recovering/rescue the ingredients when the unexpected sign(s) appears. So, my manual kneading and slap down of the dough worked to my advantage that my mixer was not able to help with. This is my photo journal on making of Paczki. The recipe is from Kat, my friend's family recipe. I've searched Internet for a while for other PONCHIK recipe, and I am surprised that there are not that many. It only means that the baker's are doing a great job in Europe making the Paczki, and I can see myself just stroll down my neighborhood and just buy the freshly fried Pazcki instead. But since I only found one bakery with PONCHIK (it is delicious) where I live, I had to try making this Paczki as well.